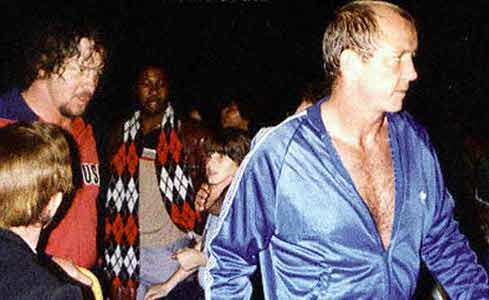 Terry Funk - Dory Funk Jr. Terry Funk and Dory Funk Jr.
Terry Funk and Dory Funk Jr.
Background: Trained by Dory Funk, Sr. 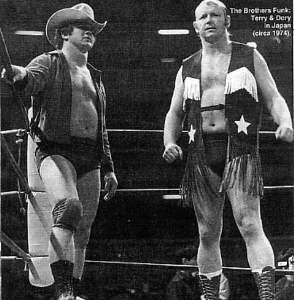 The Funks were one of the few brothers can be considered a life-long tag team, as they started teaming in Texas soon after their debuts and had their last match as a tag team in 2005, over 40 years later. During that run, they had a very successful All Japan run from the early 70s through the late 80s. 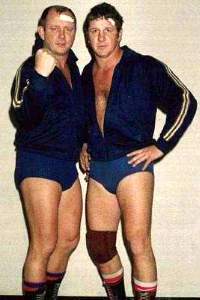 Together the Funks would win the NWA International Tag Team Championship on three different occasions, the first time in 1971 and the last time in 1973. They would have an even greater success in the Real World Tag League, which was All Japan's premiere tag team tournament. In 1977, the first year of the tournament, they defeated Abdullah The Butcher and The Sheik to win the tournament. 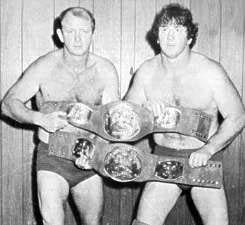 In 1979 they edged out Giant Baba and Jumbo Tsuruta to win the tournament and in 1982 they topped Bruiser Brody and Stan Hansen to win it for the third time. After no longer teaming in All Japan after 1990, on October 8th, 2001 they teamed in New Japan but lost to Bob Backlund and Tatsumi Fujinami.